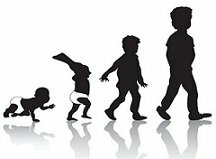 Children all go through developmental stages. Science proves that human development follows a predictable pattern. Generally children learn to creep, then to crawl, then move to standing and walking. Speech also follows a predictable pattern. Children coo, then babble, then form simple words and move on to form 2-3 word sentences. Preschoolers will learn a wide variety of skills between the ages of 3-5. Knowing the sequence of development helps child care providers to guide children through each of the stages. It makes it easier to plan age-appropriate activities for all the children in your care. Due to a vast array of personalities and environmental factors, all children at the same age will not have the exact same language or social skills. Their motor development and cognitive skills will not be equal. Do not be concerned if children are a bit faster or slower than general guidelines. Children mature at different times; therefore this list is only a guide to be used when planning your curriculum. Is an active listener when being read to, likes to turn pages, point, etc. As you can see, these are the basic developmental stages that children go through. Do not worry if a child does not progress through the developmental stages at the same time as another child. Some children may progress at a faster or slower pace than others.